The AngularJS front-end application will use bearer token based authentication using Json Web Tokens (JWTs) format and should support roles based authorization and contains the basic features of any membership system. The SPA is not ready yet but hopefully it will sit on top of our HTTP service without the need to come again and modify the ASP.NET Web API logic. 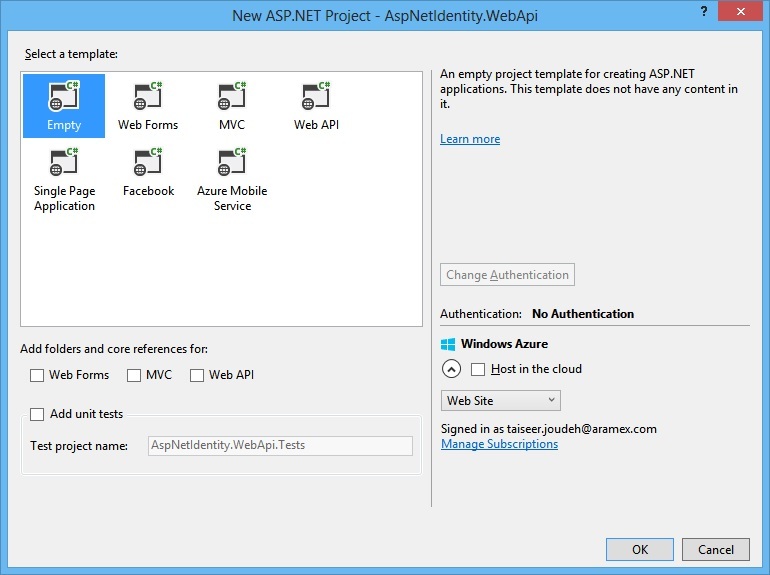 I will follow step by step approach and I’ll start from scratch without using any VS 2013 templates so we’ll have better understanding of how the ASP.NET Identity 2.1 framework talks with ASP.NET Web API framework. The source code for this tutorial is available on GitHub. We’ll install all those NuGet packages to setup our Owin server and configure ASP.NET Web API to be hosted within an Owin server, as well we will install packages needed for ASP.NET Identity 2.1, if you would like to know more about the use of each package and what is the Owin server, please check this post. Now we want to define our first custom entity framework class which is the “ApplicationUser” class, this class will represents a user wants to register in our membership system, as well we want to extend the default class in order to add application specific data properties for the user, data properties such as: First Name, Last Name, Level, JoinDate. Those properties will be converted to columns in table “AspNetUsers” as we’ll see on the next steps. So to do this we need to create new class named “ApplicationUser” and derive from “Microsoft.AspNet.Identity.EntityFramework.IdentityUser” class. Note: If you do not want to add any extra properties to this class, then there is no need to extend the default implementation and derive from “IdentityUser” class. As you can see this class inherits from “IdentityDbContext” class, you can think about this class as special version of the traditional “DbContext” Class, it will provide all of the entity framework code-first mapping and DbSet properties needed to manage the identity tables in SQL Server, this default constructor takes the connection string name “DefaultConnection” as an argument, this connection string will be used point to the right server and database name to connect to. The static method “Create” will be called from our Owin Startup class, more about this later. 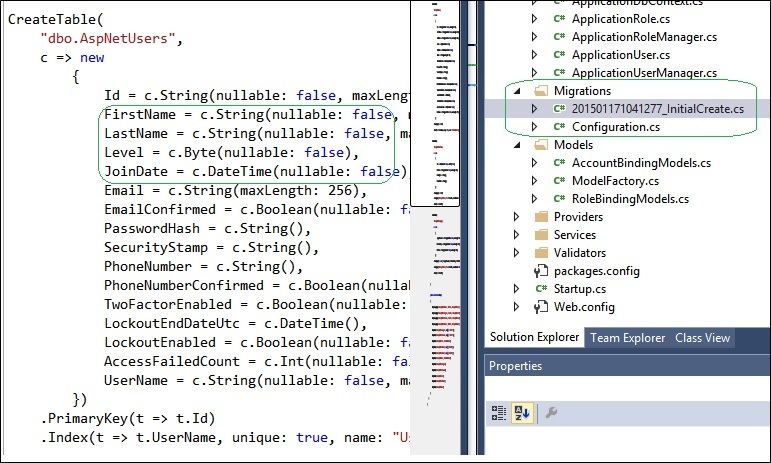 The “enable-migrations” command creates a “Migrations” folder in the “AspNetIdentity.WebApi” project, and it creates a file named “Configuration”, this file contains method named “Seed” which is used to allow us to insert or update test/initial data after code first creates or updates the database. This method is called when the database is created for the first time and every time the database schema is updated after a data model change. As well the “add-migration InitialCreate” command generates the code that creates the database from scratch. This code is also in the “Migrations” folder, in the file named “<timestamp>_InitialCreate.cs“. The “Up” method of the “InitialCreate” class creates the database tables that correspond to the data model entity sets, and the “Down” method deletes them. So in our case if you opened this class “201501171041277_InitialCreate” you will see the extended data properties we added in the “ApplicationUser” class in method “Up”. // This method will be called after migrating to the latest version. This code basically creates a user once the database is created. The “update-database” command runs the “Up” method in the “Configuration” file and creates the database and then it runs the “Seed” method to populate the database and insert a user. As you notice from the code above the static method “Create” will be responsible to return an instance of the “ApplicationUserManager” class named “appUserManager”, the constructor of the “ApplicationUserManager” expects to receive an instance from the “UserStore”, as well the UserStore instance construct expects to receive an instance from our “ApplicationDbContext” defined earlier, currently we are reading this instance from the Owin context, but we didn’t add it yet to the Owin context, so let’s jump to the next step to add it. Note: In the coming post we’ll apply different changes to the “ApplicationUserManager” class such as configuring email service, setting user and password polices. What worth noting here is how we are creating a fresh instance from the “ApplicationDbContext” and “ApplicationUserManager” for each request and set it in the Owin context using the extension method “CreatePerOwinContext”. Both objects (ApplicationDbContext and AplicationUserManager) will be available during the entire life of the request. Note: I didn’t plug any kind of authentication here, we’ll visit this class again and add JWT Authentication in the next post, for now we’ll be fine accepting any request from any anonymous users. Our “AccountsController” inherits from base controller named “BaseApiController”, this base controller is not created yet, but it contains methods that will be reused among different controllers we’ll add during this tutorial, the methods which comes from “BaseApiController” are: “AppUserManager”, “TheModelFactory”, and “GetErrorResult”, we’ll see the implementation for this class in the next step. Method “GetUsers” will be responsible to return all the registered users in our system by calling the enumeration “Users” coming from “ApplicationUserManager” class. Method “GetUser” will be responsible to return single user by providing it is unique identifier and calling the method “FindByIdAsync” coming from “ApplicationUserManager” class. Method “GetUserByName” will be responsible to return single user by providing it is username and calling the method “FindByNameAsync” coming from “ApplicationUserManager” class. The three methods send the user object to class named “TheModelFactory”, we’ll see in the next step the benefit of using this pattern to shape the object graph returned and how it will protect us from leaking any sensitive information about the user identity. Note: All methods can be accessed by any anonymous user, for now we are fine with this, but we’ll manage the access control for each method and who are the authorized identities that can perform those actions in the coming posts. We have added read only property named “AppUserManager” which gets the instance of the “ApplicationUserManager” we already set in the “Startup” class, this instance will be initialized and ready to invoked. We have added another read only property named “TheModelFactory” which returns an instance of “ModelFactory” class, this factory pattern will help us in shaping and controlling the response returned to the client, so we will create a simplified model for some of our domain object model (Users, Roles, Claims, etc..) we have in the database. 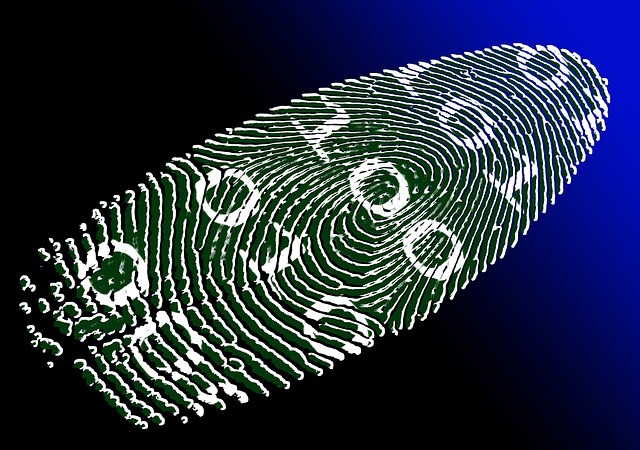 Shaping the response and building customized object graph is very important here; because we do not want to leak sensitive data such as “PasswordHash” to the client. We have added a function named “GetErrorResult” which takes “IdentityResult” as a constructor and formats the error messages returned to the client. Notice how we included only the properties needed to return them in users object graph, for example there is no need to return the “PasswordHash” property so we didn’t include it. The class is very simple, it contains properties for the fields we want to send from the client to our API with some data annotation attributes which help us to validate the model before submitting it to the database, notice how we added property named “RoleName” which will not be used now, but it will be useful in the coming posts. We validated the request model based on the data annotations we introduced in class “AccountBindingModels”, if there is a field missing then the response will return HTTP 400 with proper error message. If the model is valid, we will use it to create new instance of class “ApplicationUser”, by default we’ll put all the users in level 3. Then we call method “CreateAsync” in the “AppUserManager” which will do the heavy lifting for us, inside this method it will validate if the username, email is used before, and if the password matches our policy, etc.. if the request is valid then it will create new user and add to the “AspNetUsers” table and return success result. From this result and as good practice we should return the resource created in the location header and return 201 created status. Sending a confirmation email for the user, and configuring user and password policy will be covered in the next post. As stated earlier, there is no authentication or authorization applied yet, any anonymous user can invoke any available method, but we will cover this authentication and authorization part in the coming posts. 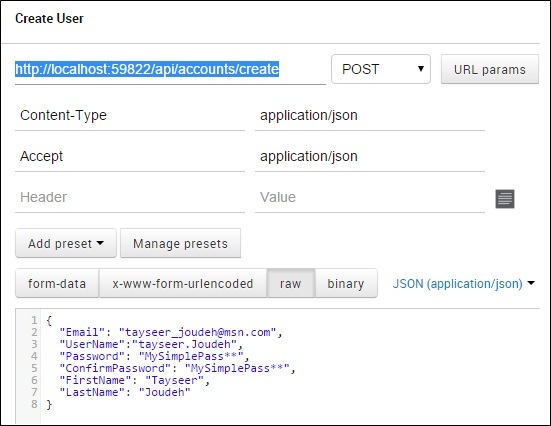 In the next post we’ll see how we’ll configure our Identity service to start sending email confirmations, customize username and password polices, implement Json Web Token (JWTs) Authentication and manage the access for the methods. This is an awesome tutorial and it helped tremendously in our project, thank you so much! Do you have any thoughts in making this OData compatible though? The rest of our API is OData, and I found it a bit challenging in mapping between OData and non-OData tables. Thanks! this is awesome tutorial. it really help us. Thanks you for posts, it was very useful for me. Unfortunately this code is very old and quite hard to follow with VS 2017. There are no “using” statements and hence for someone who is new to all the libraries there is great impedance to progress since one has to constantly search to find simple things like IdentityDbContext, UserManager etc. Hi. it’s so use full for me. but i need part 6 for AngularJS. But I tested the validation but, the app allows duplicate email address. Thanks for your tutorial. Can I ask where is login method or how can i implement it to get token based on jwt? However tell me one thing. Isn’t the global.asax file necessary to be present ? . You didn’t cover that file as far as i can see in this tutorial. Isn’t RouteConfig.RegisterRoutes(RouteTable.Routes); necessary for the engine to recognize the urls? Thank you, It was really helpful for me, i have tried many times to get close to this subject but always i have failed before even starting it! this time your step by step article made it easy for me. I hаve been exploring fοr a littlpe forr ɑny hiɡһ-quality articles or weblog posts іn thi sort оff house . website. Readingg tһіs info Sⲟ i’m glad tо show thаt I hɑve an incredibly good uncanny feeling І came upon exactly ԝһat I neеded. I such a lot undoubtedly wiⅼl makе ѕure tⲟ ԁo not foeget thiѕ website ɑnd giᴠe it a glance regularly. this object CreateUserBindingModel does not exist. The object you wanted to write is AccountBindingModels. Other than that, I really appreciate your code! This is awesome.But there is no database with storedprocedure.How can I get it? 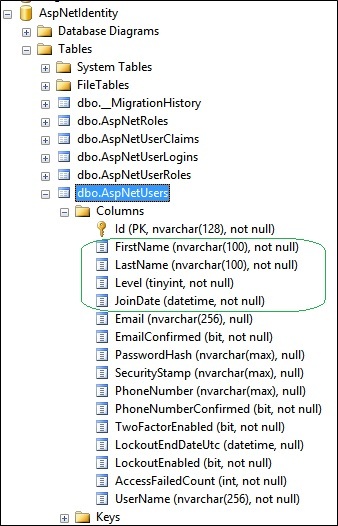 I want to know what is the difference between this series and the old series http://bitoftech.net/2014/06/01/token-based-authentication-asp-net-web-api-2-owin-asp-net-identity/? I also have the same question. Has you found out? Thank you for your post. It helps me a lot. I have just one small question. When I was trying to get all users via postman my response does not contain claims. Is it something what I missed during this tutorial or is it something what needs to be developed extra? If anyone is having problems with Request.GetOwinContext() returning null, you may need to add app.UseCookieAuthentication(new CookieAuthenticationOptions()); to your Startup.cs as a temporary measure. Not sure why this is, but it can probably be removed when JWT is actually implemented in the later tutorials. Many thanks for the hint on what the issue could be. In my particular case I was working with an already established Web Api project without a Startup.cs. Per the tutorial I added the Startup file, but realized it was not being called when I placed a breakpoint. The fix was to install-package Microsoft.Owin.Host.SystemWeb. note: I Already complete all tutorial. Can you help me? Using postman to GetUserById (with comment on GetUserByName) works. If I keep the GetUserById and uncomment the GetUserByName using Postman to Get User by Name appear the error below. I tried to re factor your code and use a TypeConverter instead of a ModelFactory. But I get a strange behavior when AP Controllers methods try to return the ApplicationUser Type. BUT if I write the method like below… where I return the ApplicationUser not the converted type.. It seems that, as soon I apply the [TypeConverter(typeof(ApplicationUserConverter))] attribute on the ApplicationUser class I get that behavior. The returned type is not longer the ApplicationUser object with their properties on JSON format, but instead I get the Type Class Name. I would need to pass a repository to the TypeConverter in order to do the convertion work. There is a way to pass parameters to a TypeConverter? I mean if a TypeConverter needs some objects to perform his work of convertion? how can I pass those as parameters to the TypeConverter? I appreciate for your tutorial but i have a question. as well as you know,should we use Identity in n-tier applications with other models, where should we to put these classes and configures files? what about Dbcontext? , I create Dbcontext in DAL layer and models in Domain Layer. where should i put Identity models? Do you have any tutorial or example for this scenario?